He is keenly aware of the obligation. 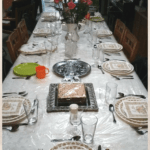 Meir’s parents emigrated to Jerusalem from the United States soon after the Six Day War. That miraculous victory paved the way for Jews – who, due to massacres from the late 1920’s to the late 1940’s were driven from the Gush Etzion bloc – to return. In the 1980’s his family joined the thriving Jewish presence in “the Gush” – just south of Jerusalem and Bethlehem, in Judea. Today, there are over 70,000 Jewish residents in that region. 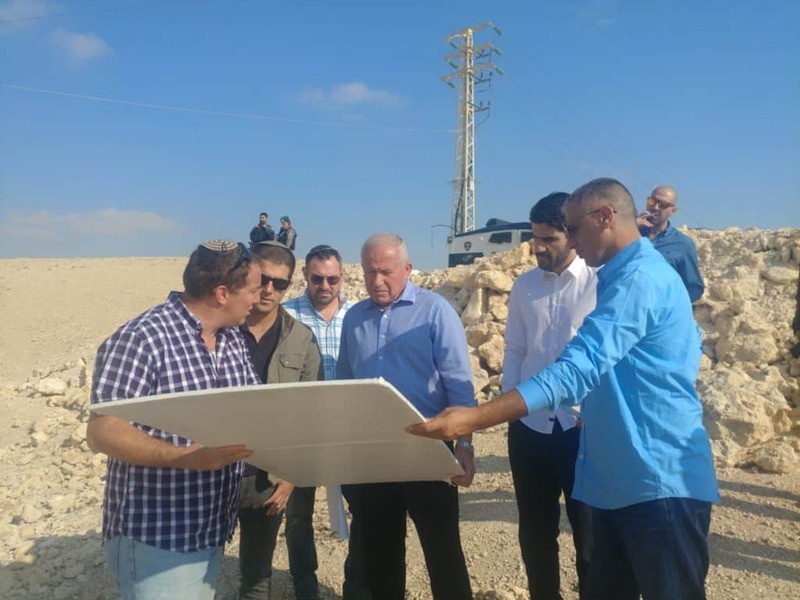 At Khan al Ahmar, Meir Deutsch, CEO of Regavim, briefs Chairman of the Knesset Foreign Affairs and Defense Committee MK Avi Dichter. During his army service, Meir Deutch was stationed in the Negev Desert. There, he was taken aback by the great contrast between the orderly growth of Jewish communities and the chaos he saw in the Negev. “I saw total lawlessness all the time. Something had to be done!” Meir declared. After completing his army service, Meir contacted (now Member of Knesset) Betzalel Smotrich and Yehuda Eliyahu, founders of Regavim. Since 2006 Meir has joined forces with them to promote law and order. 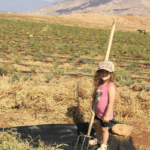 They have extended their efforts northward to the Galilee, where a large Arab population, enjoying the privilege of citizenship, nevertheless builds extensively without permits and without paying taxes. 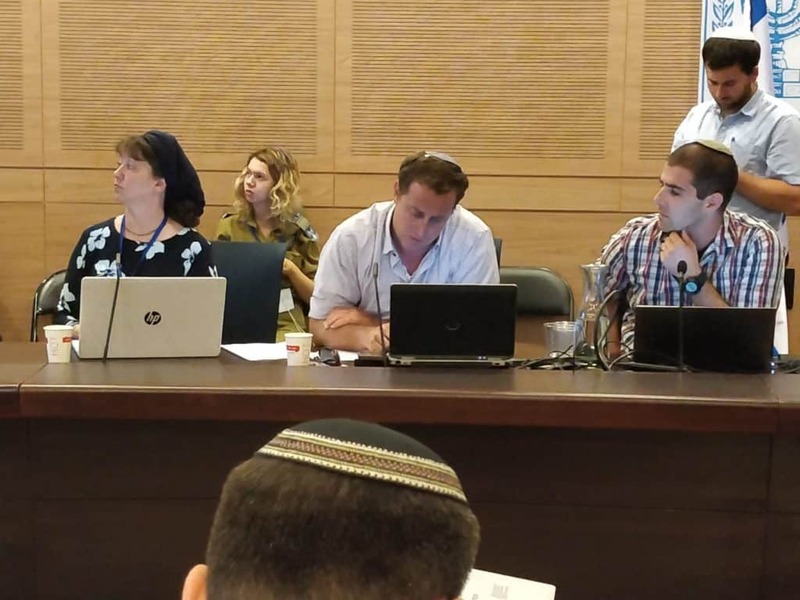 Meir Deutsch and members of the Regavim team at a hearing of the Knesset Foreign Affairs and Defense Committee’s subcommittee on Judea and Samaria. Now the proud CEO of Regavim, Meir recalls one of the organization’s victories against injustice. Shai Dromi, a sheep farmer in the Negev, had been consistently victimized by Bedouin thieves stealing his sheep and farming equipment. In 2007, shortly after his dogs had been poisoned, he awoke at 3 a.m. to the barking of his new guard dog. While checking on his sheep, he discovered trespassers. Though he fired what he meant to be warning shots, Shai mortally wounded one of the intruders. 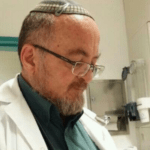 He was charged with manslaughter and jailed until Regavim organized support and lobbied for the 2008 “Dromi Law,” which legalizes a property owner’s right of self-defense. How serious is the phenomenon of land-grabbing through illegal building? Although such activity is clearly against the law, Regavim’s field workers have documented facts and created maps showing over 70,000 illegal structures across 650,000 dunam of stolen land. Regavim launches lawsuits and assists government agencies to create policies and strategies to deal with this threat. 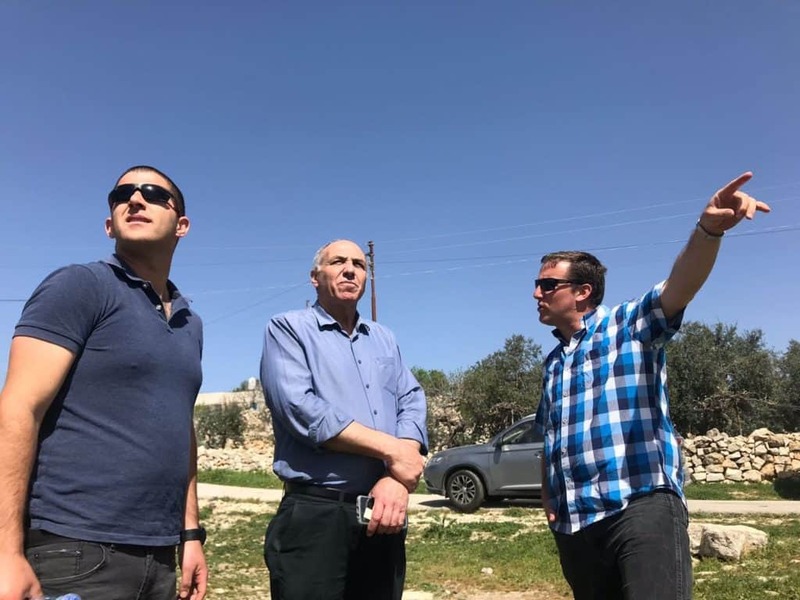 In addition, using social media to share awareness and seek funding, Regavim lobbies the Israeli government in support and on behalf of municipalities of Jewish settlements suffering from these infractions. 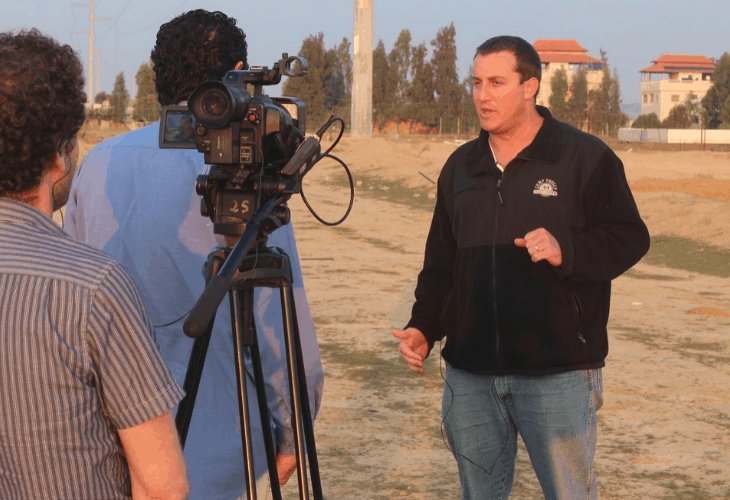 CEO Meir Deutsch conducts a field survey of illegal Arab land seizure projects. Pictured: MK Moti Yogev, Chairman of Judea and Samaria Subcommittee of Knesset Foreign Affairs and Defense Committee. For Regavim, it’s a race against time: In 2009, then Palestinian Prime Minister Salem Fayyad called for millions of dollars in European Union funds that support Palestinian “agricultural causes” to be channeled into building on stolen lands, rather than developing areas A (under complete Palestinian control) and B (under Palestinian civil control and Israeli security). He directed building efforts to create facts on the ground in Area C, the one area over the 1967 “Green Line” where Jews are permitted to live. If gone unchecked, within the next ten years, the illegal expansion of the Palestinians in Area C will practically turn this area into “Palestine.” One example of such activity is the illegal construction of UN schools on the borders of Jewish communities. 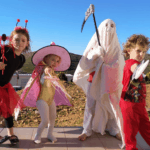 Regavim exposes the “connect the dots” plan, showing the Palestinian efforts leading to the illegal construction of houses for families whose children attend these new schools. Confident that the images of Israel tearing down these structures -deliberately fed to the media- will intensify anti-Israel sentiment, the Palestinians can only gain from their destructive plan. Regavim must be victorious in its plight to protect the Holy Land and the rightful owners who must be free to settle it. Along with the fight against illegal Bedouin building and the disregard for law in the Galilee, they are engaged in a battle for the Redemption of Zion. The Heart of Israel urges all who want to see the prophecies continue to flourish in our times to support efforts of Regavim, “Like” them on Facebook and “Share” their plight to guarantee Israel’s sovereignty over the Holy Land. Watch this two minute update on the work Regavim has accomplished within the first quarter of 2019.